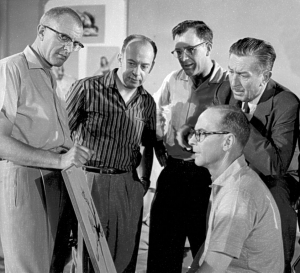 As was inevitably always going to be the case, the last of Walt Disney’s fabled Nine Old Men – the artists he bestowed the legacy of his animation production to as he moved into other areas of entertainment – has passed away in Sequim, Washington. Ollie Johnston began his career at the Disney Studios in 1935, on a Mickey Mouse cartoon, and he often worked in tandem with Frank Thomas, whom Johnston had met in school at Stanford, and would be inextricably linked to for life, until Thomas passed away four years ago. Together the pair joined the seven other Old Men to create a lasting series of animated features, including the groundbreaking Snow White And The Seven Dwarfs and all of the early Disney pictures (Fantasia, Pinocchio, Bambi, Song Of The South, Cinderella, Alice In Wonderland and Sleeping Beauty) all now regarded as animation masterpieces, and in which Johnston and Thomas’ scenes are often cited as those movies’ highlights. 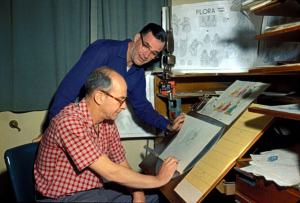 After retirement in 1978, Ollie remained on tap to the next generation of Disney artists, supervising The Fox And The Hound in 1981, and tutoring such new talents as Andreas Deja and Glen Keane. Ollie also committed his vast experience and knowledge to the printed page, in a number of books co-written with Frank: Too Funny For Words, The Disney Villain and, perhaps most importantly, Disney Animation: The Illusion Of Life, still regarded as the animator’s bible. Johnston and Thomas’ relationship in life and work was captured on film in the charming 1995 documentary Frank And Ollie, their names, characteristically describing the closeness of their friendship, rolling off the tongue “like they were one person”, as Glen Keane put it. Indeed, in the same year’s Mickey Mouse short Runaway Brain, one character is named Dr Frankenollie in tribute to the pair. In recent years, Frank and Ollie pursued personal interests – particularly Ollie with his lifelong fascination with railroad trains (he also owned a full size narrow gauge engine, named Marie E for his wife, later sold to Pixar’s John Lasseter) – though they continued to spread their words of wisdom on animation, this time online, in the shape of the FrankAndOllie.com website. They were likewise revered by the animation community, especially by director Brad Bird, who memorably gave them both cameo appearances (voiced by the gentlemen themselves) in his features The Iron Giant (1999) and The Incredibles (2004), in which the perfectly appropriate line “There’s no school like the old school” was uttered. Not only is that truer than ever today, but Ollie Johnston’s life, and death this past Monday evening, means it will never be the same again. Ollie Johnston, one of the greatest animators/directing animators in animation history and the last surviving member of Walt Disneyâ€™s elite group of animation pioneers known affectionately as the Nine Old Men, passed away from natural causes at a long term care facility in Sequim, Washington on Monday April 14th. He was 95 years old. During his stellar 43-year career at The Walt Disney Studios, he contributed inspired animation and direction to such classic films as Snow White And The Seven Dwarfs, Pinocchio, Fantasia, Song Of The South, Cinderella, Alice In Wonderland, Peter Pan, Lady And The Tramp, Sleeping Beauty, Sword In The Stone, Mary Poppins, The Jungle Book, Robin Hood, The Rescuers, and The Fox And The Hound. In addition to his achievements as an animator and directing animator, Johnston (in collaboration with his lifelong friend and colleague Frank Thomas) authored four landmark books: Disney Animation: The Illusion Of Life, Too Funny For Words, Bambi: The Story And The Film, and The Disney Villain. Johnston and Thomas were also the title subjects of a heartfelt 1995 feature-length documentary entitled Frank And Ollie, written and directed by Frankâ€™s son, Theodore (Ted) Thomas. In November 2005, Johnston became the first animator to be honored with the National Medal of Arts at a White House ceremony. Born in Palo Alto, California on October 31, 1912, Johnston attended grammar school at the Stanford University campus where his father taught as a professor of the romance languages. His artistic abilities became increasingly evident while attending Palo Alto High School and later as an art major at Stanford University. During his senior year in college, Johnston came to Los Angeles to study under Pruett Carter at the Chouinard Art Institute. It was during this time that he was approached by Disney and, after only one week of training, joined the fledgling studio in 1935. The young artist immediately became captivated by the Disney spirit and discovered that he could uniquely express himself through this new art form. The pioneering animator was honored by the Studio in 1989 with a Disney Legends Award. In 2003, the Academy of Motion Pictures Arts and Sciences held a special tribute to him (and Frank Thomas), Frank And Ollie: Drawn Together, in Beverly Hills. Johnston and Thomas were lovingly caricatured, and even provided the voices, in two animated features directed by Brad Bird, The Iron Giant, and Disney/Pixarâ€™s The Incredibles. The Cartoon Brew website also has a number of updates and tributes from friends and colleagues remembering Ollie Johnston.